I love it when you bite into something right off the grill and you get that snap feeling and sound. It’s fresh, seared and bursting with flavor. 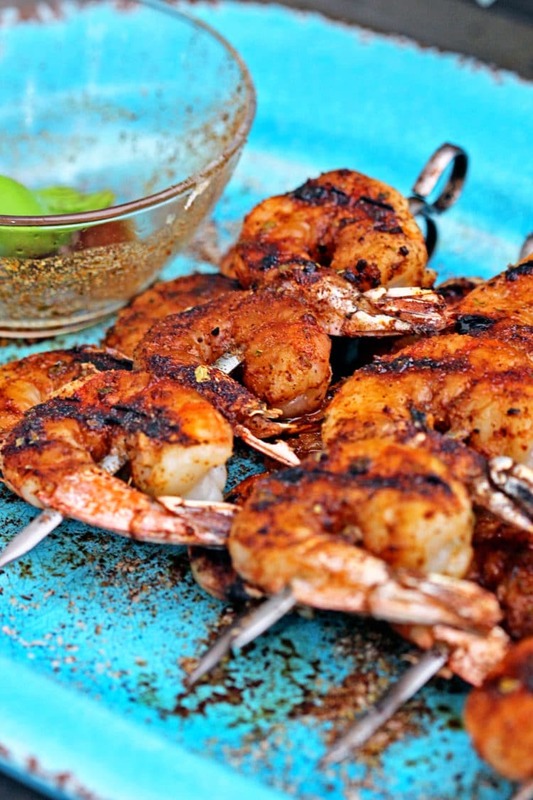 That’s what’s happening here with these Ancho Chipotle Chili Lime Grilled Shrimp! You can always moderate the amount of heat seasoning, but for me these hit the spot for spice, flavor and a light meal. 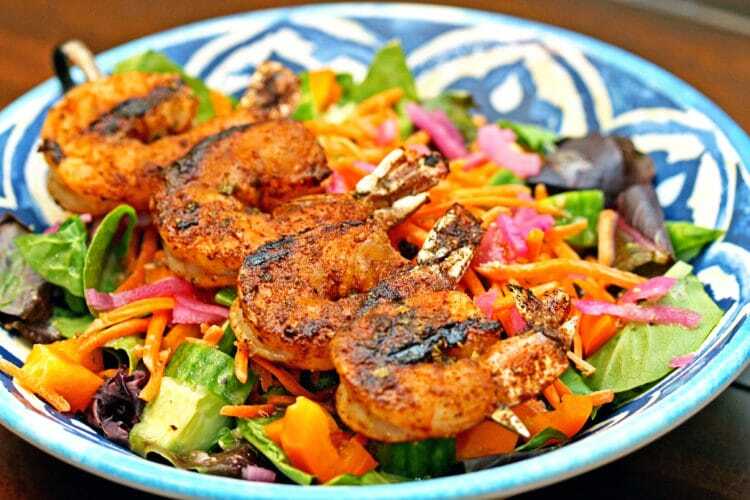 Fresh grilled shrimp, bumped up with a quick spice marinade and served over dressed mixed greens, marinated red onions, shredded carrots, Persian cucumbers and orange bell pepper. A little trick I use is to keep the amount of spices I buy in small quantities because I don’t want to use something that has been in my seasoning cabinet for over a year and doesn’t pack the punch it once did when I first bought it. That doesn’t mean I have a small the quantity of spices by any means, I have a plethora of them, but I prefer quality over buying in quantity. So enough of that soapbox chatter, let’s get cooking! In a small bowl mix together the ground Ancho and Chipotle powders, garlic and onion powders and kosher salt. 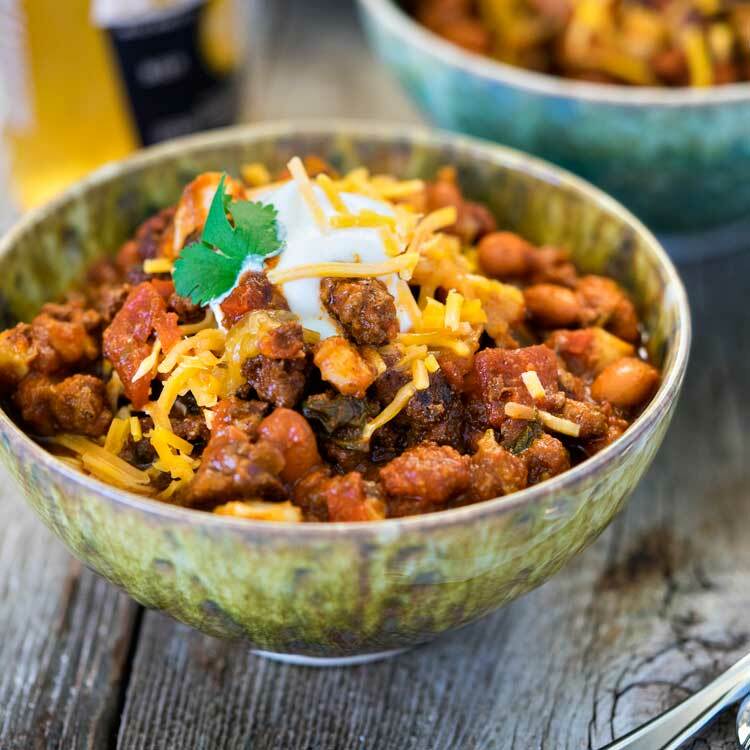 With your hands be sure to rub together the Mexican oregano to crumble in the same spice bowl. It’s an aromatic that is so distinctive and definitely different than other dried oreganos. Next, in a small saute pan, toast the cumin and grind. Add that to the to the other spices and mix well. Whenever possible I like to toast my seed spices to bring out their full flavor and essential oils and then grind them, but feel free to use store bought ground, they work fine. 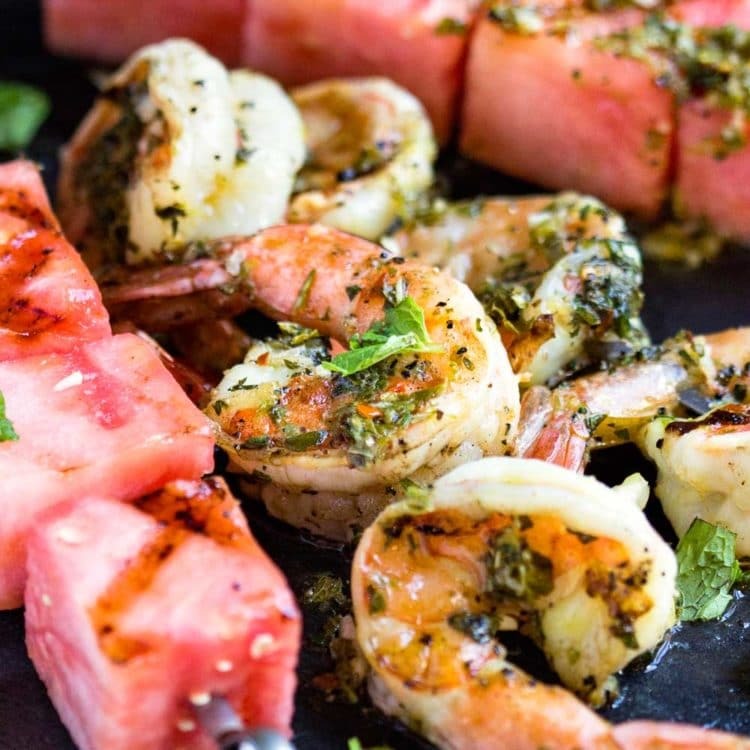 Sprinkle most of this mixture over the fresh, deveined and washed shrimp you have put on skewers, making sure to coat both sides. Reserve about a 1/2 teaspoon to mix in the basting mixture. Cover with plastic wrap and refrigerate to marinate for 30 minutes as you prep the red onions. In another small bowl add the thinly sliced red onions and soak in cold water for 10 minutes to take the powerful onion flavor down a bit. Drain water and marinate in Rice Wine Vinegar, soaking them for at least 30 minutes. Reserve vinegar for salad dressing. 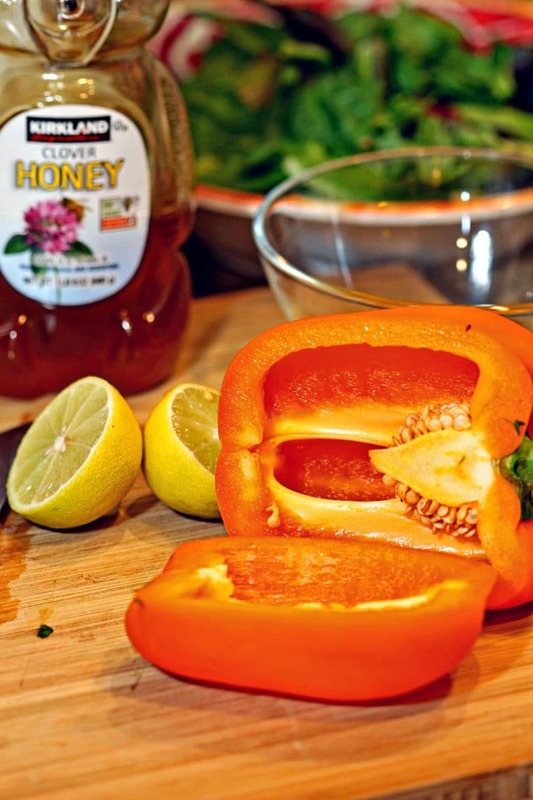 In a small bowl mix together the reserved spice rub, juice from the limes and honey. Stir to mix well, this will be your basting sauce as the shrimp grill. 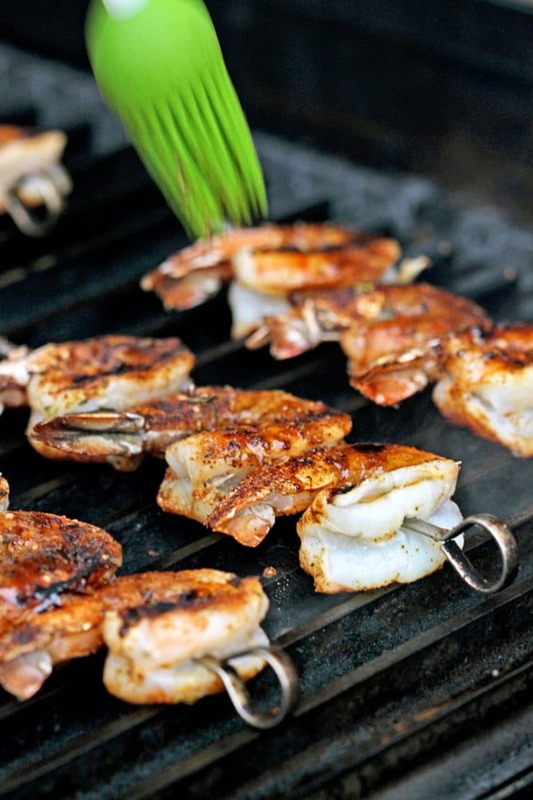 Clean and scrape anything from previous grilling and spritz or wipe the grill with some vegetable oil. Place the shrimp skewers on and cook 2 minutes per side, these were fairly large, but not “prawn” size. 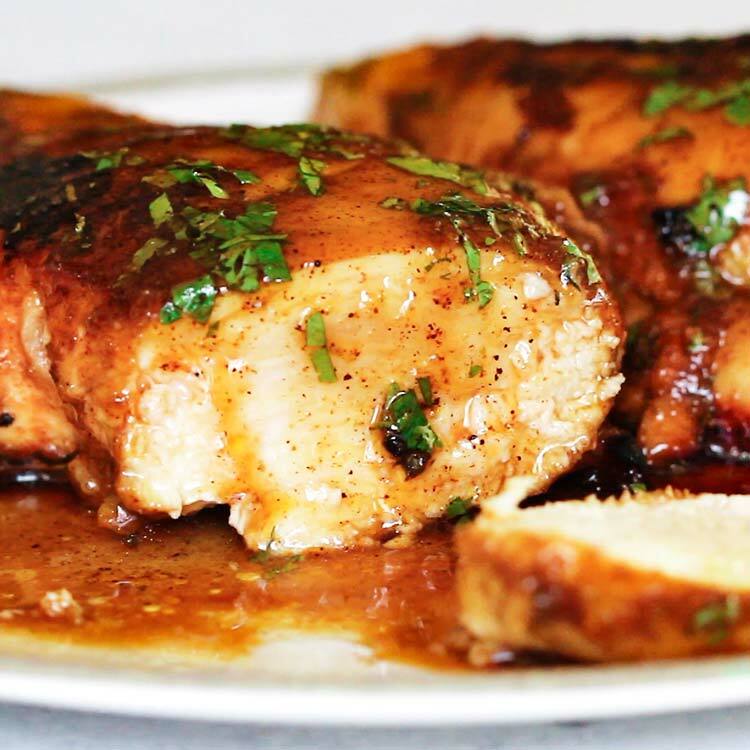 Baste with honey, lime and spice mixture. 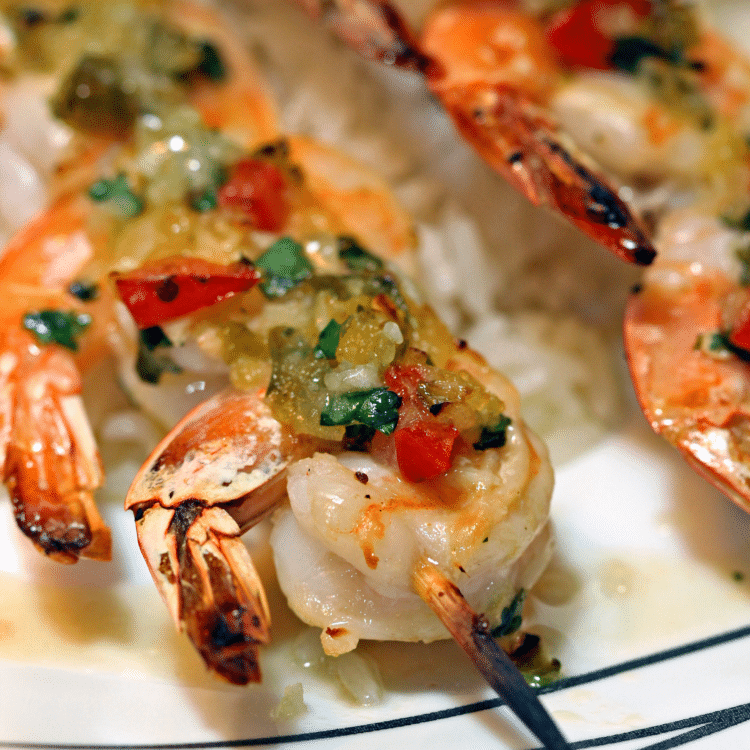 Remove from grill and allow to cool slightly before serving. 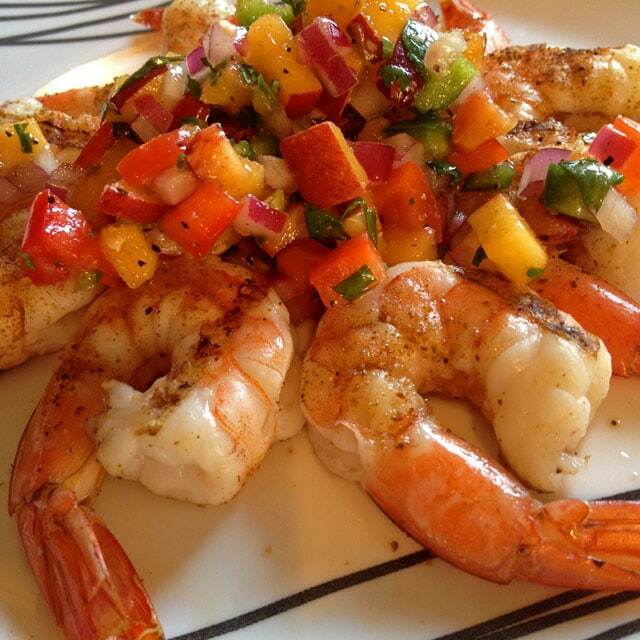 Feel free to serve these as is with a side dish of your choice. I made a salad of mixed, chopped Spring greens, marinated red onion, shredded carrots, diced Persian cucumbers and orange bell peppers. I tossed the salad with a quick dressing of the reserved rice wine vinegar, a little olive oil and kosher salt and fresh cracked black pepper. 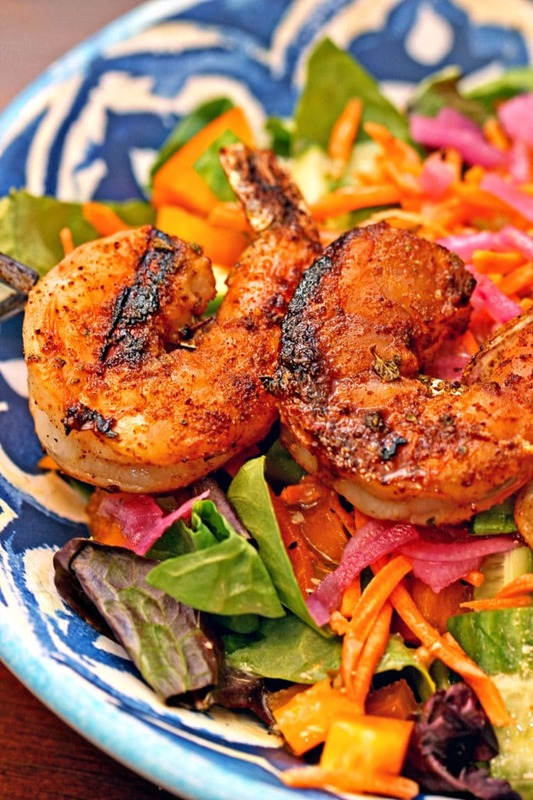 These shrimp are packed with spicy goodness and the salad helps keep things cool. Enjoy! 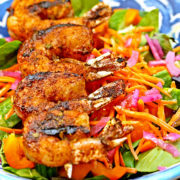 In this Ancho Chipotle Chili Lime Grilled Shrimp you start with a spicy dry rub and baste on the grill with a honey lime sauce. Top these beauties on a mixed salad with vegetables and a lime olive oil dressing. This is the spice mixture amounts I like best, but feel free to cut in half for your own tastes. In a small bowl add half of a thinly sliced red onion and soak in cold water for 10 minutes and drain. Pour Rice Wine Vinegar to cover, soaking them for at least 30 minutes. Reserve vinegar for salad dressing. In a small bowl mix together the ground Ancho, Chipotle, garlic, onion powders and kosher salt. With your hands be sure to rub together the Mexican oregano to crumble in the same spice bowl. Next, in a small saute pan, toast the cumin and grind or feel free to use store bought ground, add to spice mix. 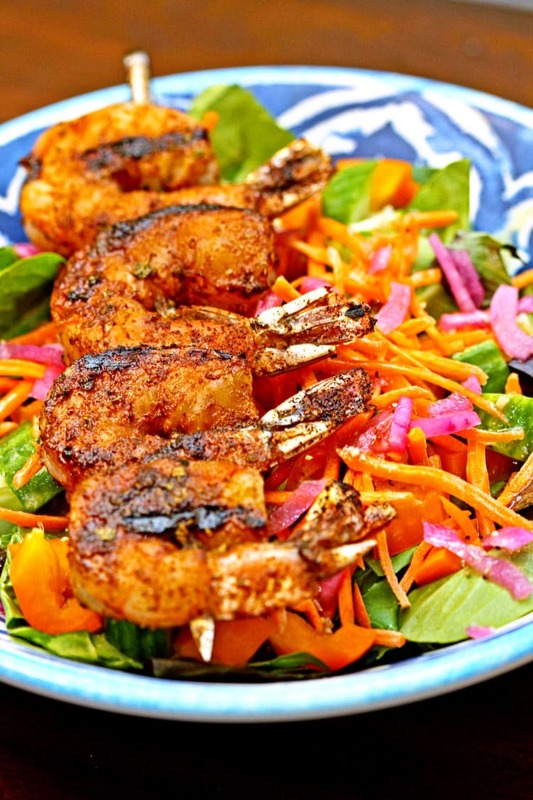 Sprinkle most of spice mixture over the fresh, deveined and washed shrimp you have put on skewers, coat both sides. Reserve about a 1/2 teaspoon to mix in the basting mixture. Cover with plastic wrap and refrigerate to marinate for 30 minutes while red onions marinate. 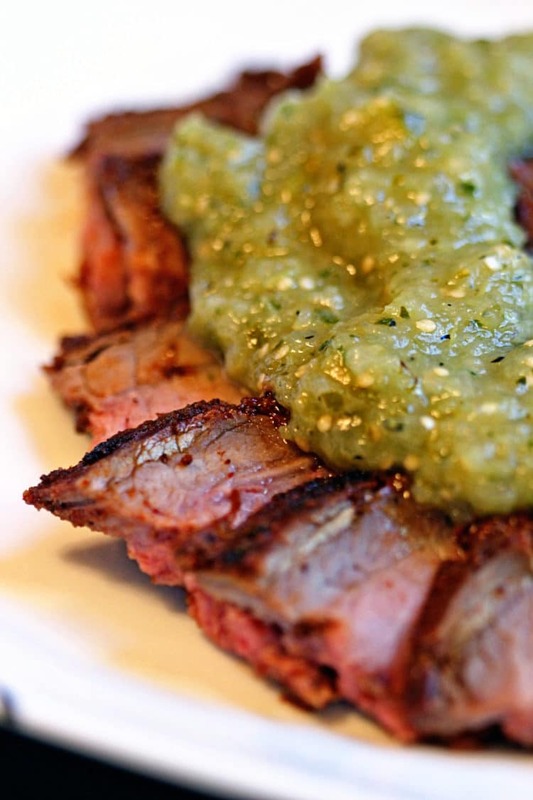 In a small bowl mix together the reserved spice rub, lime juice and honey. Stir to mix well, this will be your basting sauce as the shrimp grill. Get your grill up to 375°F. 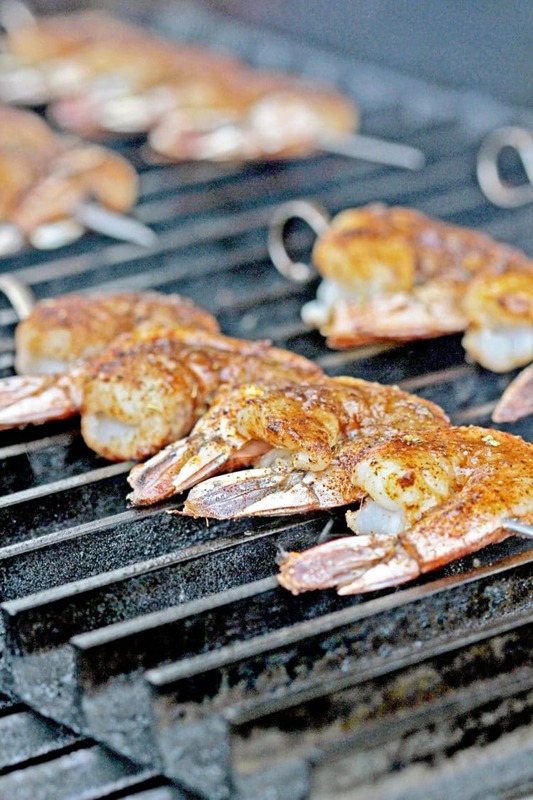 Clean and scrape anything from previous grilling and spritz or wipe the grill with some vegetable oil. 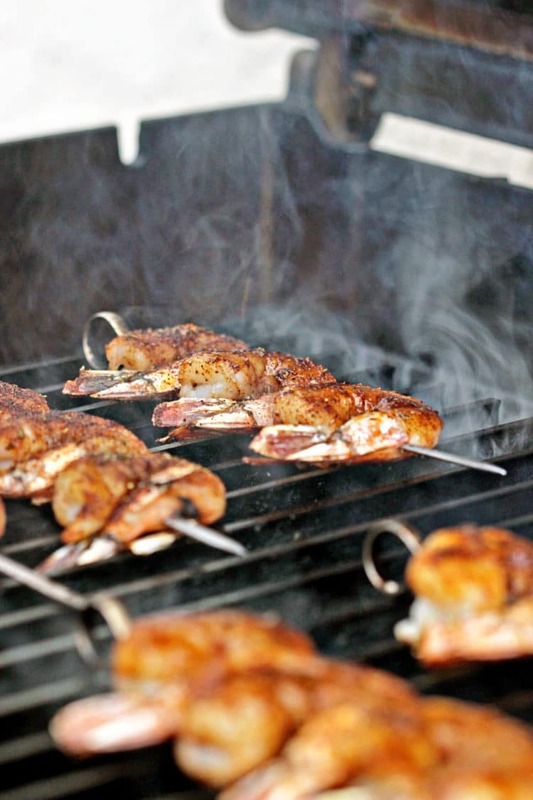 Grill seasoned shrimp kabobs for 2 minutes each side and baste after each turn. 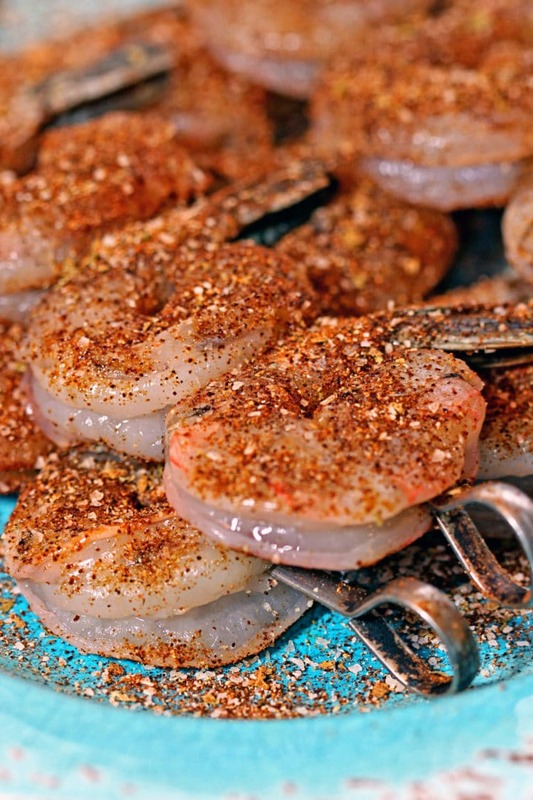 Make a quick dressing from reserved rice wine vinegar, olive oil and kosher salt and fresh cracked black pepper. 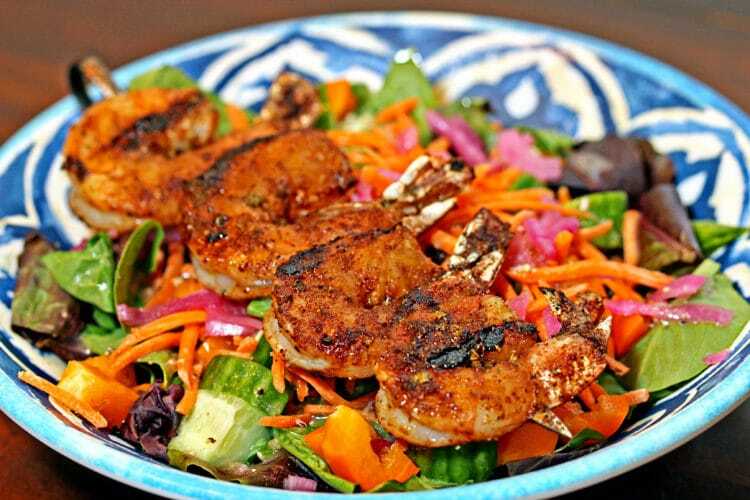 Pour over mixed salad greens, shredded carrot, diced Persian cucumber and red onions. 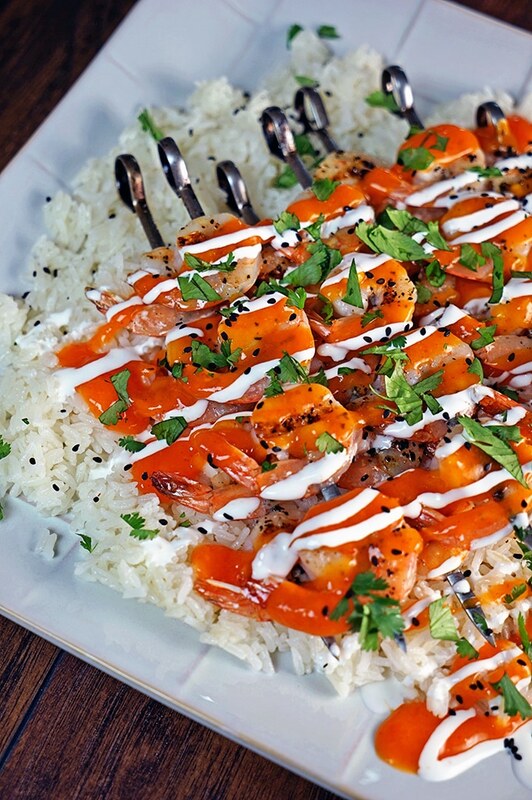 Top with grilled shrimp and serve. 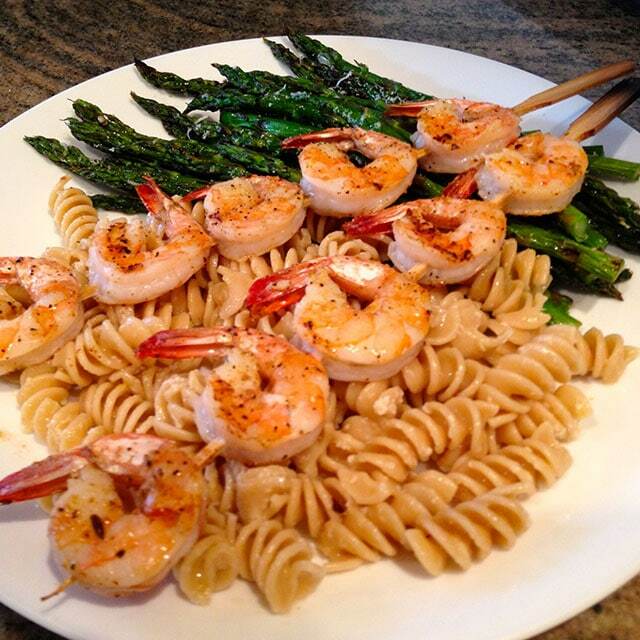 Hey there Julie, thanks for stopping by the site and trying out the recipe. Sorry if it was too hot for the two of you. I updated the recipe to note halving the chipotle. I love the flavor and guess over time have built up a tolerance. Again, sorry if it was too hot for you and I love the fried rice idea. Throw some chopped pineapple and that should help balance the heat.